A friend of mine recently went to view a house with her husband and one-year-old daughter. When she told me of their experience I just had to write about it, so hopefully other sellers out there will think a bit more and ultimately, both buyers AND sellers will benefit. It all started in the kitchen. The owner was away for the weekend and had left her (admittedly very polite and well-mannered) teenage son in charge of the viewings. Unfortunately he had at the time got 5 friends over, all ranged around the kitchen table so the first impression was of a very small kitchen with too many people in it. And that’s before my friends realised that also in that kitchen were half a dozen dogs in two cages. Just have a think about this situation for a moment: there’s 6 teenagers, a man, a woman, a very small child who may or may not have seen half a dozen dogs in one place before, and the aforementioned half a dozen dogs. 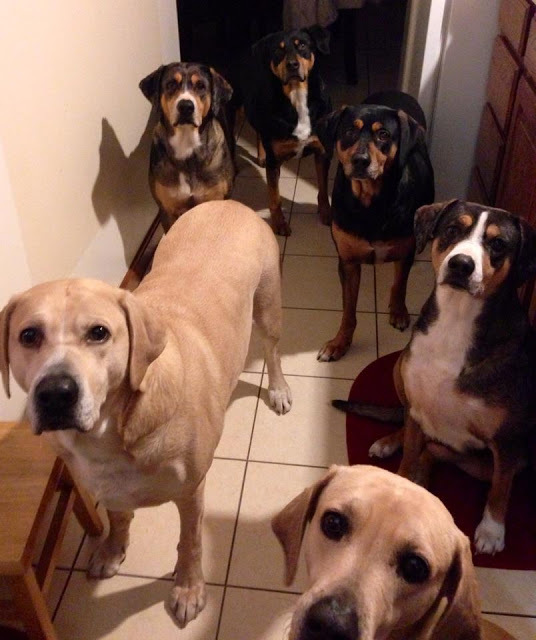 That’s nine humans and six dogs, all squashed into a kitchen which probably has a fair amount of fitted furniture and isn’t the largest of rooms, so everyone’s bound to be violating the personal space thing even before you add in the dog cages. Now imagine the sounds – those 6 dogs are probably going to have something to say about 3 brand new humans in their home. It might be “ooh hello new people” or “I’m not too sure about you” or even “GET ORF MY LAND”, but whatever it is they’re probably going to make some sort of doggy noise. Noise about which the man and the woman may or may not feel comfortable, and about which the poor child might understandably have something to say in return. And she’s only one, so it’s probably going to be a high-pitched response. The dogs probably smell. Actually come to think about it, the teenagers might whiff a bit too. Let’s sum it up so far: squashed, potentially noisy, probably smelly. Not a great first impression. But it gets worse – moving on into the living room, my poor friends are faced with a free range Great Dane and yet another large hairy dog on the sofa. 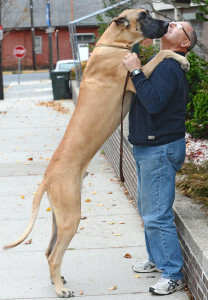 For those of you like me who aren’t very good with dog brands, a Great Dane is big. Really big. You can get smaller horses. And this one jumped up to say hello. The owner’s son assured my friends that the dog was just being friendly, but how much do you trust the word of a teenager you’ve only just met and whose big toothy dog face is in your face, right next to your defenceless daughter’s face? And how exactly are you going to tell your one-year-old daughter that there’s nothing to worry about, even if it is just a friendly hello? At this point, she was trying to climb onto her father’s head to get out of reach of the dog. Noise level: ranked up a couple of notches. Panic level: probably getting there right about now. Roughly 17 seconds later my friends braved the dog-zone once more, and as if to seal the fact that they would never live in this house in a million years even if the owner gave it to them, they saw that the garden was covered in Great Dane-sized poop. REALLY? I can understand that it might be somewhat complicated to remove EIGHT dogs from your house while you conduct a viewing but did you not think to remove all the dog dirt from the garden? It’s a 4-bedroom house for goodness sake, the most likely buyers are a family and are they really going to like imagining their children playing on the lawn if their first view of it was covered in dog poo? I’m sorry, I got a bit ranty there. I’ve always maintained that it’s best to keep animals out of the viewing situation, and minimising the signs that you have pets in case the buyer is allergic, or anti-dog, or anti-cat, or anti-whatever-it-is-you-call-part-of-the-family. Some pet owners just can’t understand it, but I hope this rather extreme story helps you to see things from a buyer’s point of view. My friends left that house feeling out of control and scared for the safety of their child. However much you love your dogs, I’m sure you understand that this isn’t a nice way to make anyone feel, and it certainly isn’t the way to make potential buyers feel if you want them to buy your house. There is NO WAY my friends would ever consider buying that house. Not at all. Regardless of whether its location, size, configuration and price were perfect for their every need, they just wouldn’t entertain the idea of living there for even a split-second. Those dogs effectively killed that sale. They refer to that house as “The Dog House”, so you can see how completely those dogs upstaged the house in every single way, leaving no room for any positive thoughts about the house itself. I know “The Dog House” viewing is an extreme situation, and your one lazy pug who never moves off the sofa might seem a world away from the pack described above, but the same rules apply for any pet-owners. Your dog and its accompanying hair, smells, damage and waste will NOT help you sell your house. A fellow dog-nut might see past it all, but how do you know that the next buyer through the door will be a fellow dog-nut? So if you leave your dog in the house and the poop on the lawn, you’re leaving your house sale to chance. You’re no longer in control, and you’re stuck in limbo while you wait for someone else to decide that it’s time for you to move on to the home you’d much rather be living in. And of course, when I say dog, I also mean cat, ferret, rabbit, rat, bird, pig or anything else that lives with you but isn’t human. Please don’t think that I’m a pet-hater because I’m not, I’ll be the archetypal crazy cat lady one day, but when you’re selling your house pets probably won’t help. Please sellers, just think carefully about the situation you’re asking your buyers to walk into and try to make it a comfortable situation for everyone, not just you.